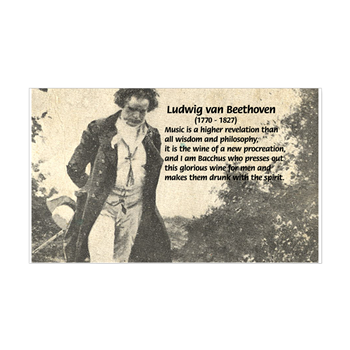 So said Ludwig van Beethoven. Bacchus deserves to be the center of attention. 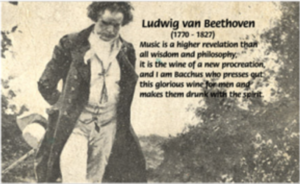 Here, wine and music are presented in parallel, in concert, in a duet of delicious parables about symphonies and scores and oenophile experiences. What to serve the mind and mouth. Where wine and music meet, over a theme, a composition or a concert, and the best of life can be savored. If you would like to join the party, and be a Bacchus too, sign up for the IAMBACCHUS news letter. or attend some exquisite and unique culinary concerts that feature, what else? Read on fellow Beethovenians and Bacchae, O Maenads of Dionysus, free yourself to Eleutherios, raise your glasses and bows and make your toasts. I AM BACCHUS is your portal to a more maliciously delicious musical life. “Too many notes.” So said Emperor Leopold in Amadeus. Wines are like musical notes on a page. Sometimes there are too many to choose from and are simply labels on a shelf. What makes wine wonderful? How to decide? This section is about choosing wine. How to know which year is the best vintage, which locale is best for the grape, who are the best producers of wine, which regions are the best to make wine, where and how to buy the wine, and much, much more. Most of all, it gives me a chance to feature a wine, even if I am not writing a wine and music article about it. The first wine to be chosen? The most recent. A fantastic Amarone I drank at Estro, my favorite wine bar in Venice. Monte dei Ragni, 2010 is a mouthful of sugar and spice. It sticks to your tongue like the spider web on the label of the bottle. Like the famous Quintarelli, at 16%, the Monte dei Ragni is on the high end of the Amarone alcohol spectrum yet still retains a smooth finish. It also contains many of the deep tannins and full body texture of the great dal Forno Amarone. 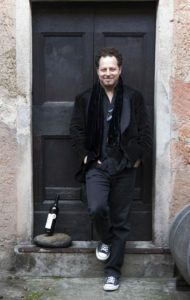 Zeno Zignoli, the great winemaker, has found a perfect balance of 25% Rondinella-50% Corvina- 20% Corvinone- 5% Molinara. The majority Corvina is what gives the wine its power. Monte dei Ragni comes from the traditional classico viticultural zone of Valpolicella in Veneto, north-eastern Italy. Those examples from the classico vineyards around Fumane, Marano, Negar and Sant’Ambroglio are considered the finest, and rank among the top wines in Italy. Monte dei Ragni comes from Località Marega in the comune of Fumane in Valpolicella. Right in the center of the spider web. 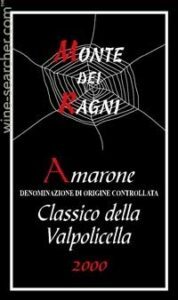 If you are seeking a not so expensive Amarone that meets the tastebuds of the supple and savage, Ragni 2010 is a good choice. 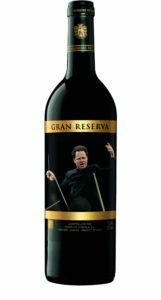 It is a wine that goes with those Con Brio symphonies of Beethoven. In this case, let us choose the 7th, which Wagner called the “apotheosis of the dance.” After a bottle of Ragni, you just might be compelled to dance the night away! With an extraordinarily diverse repertoire, innovative programming and charismatic performance style, John Axelrod continues to increase his profile as one of today’s leading conductors. After successful tenures as Music Director and Chief Conductor of the Lucerne Symphony Orchestra and Theater, and as Music Director of the l’Orchestre National des Pays de la Loire, in 2011, John Axelrod was appointed Principal Conductor of Orchestra Sinfonica di Milano “Giuseppe” Verdi (LaVerdi), extended through the 2017 season, and in 2014 he became the new Artistic and Musical Director of the Real Orquesta Sinfónica de Sevilla (ROSS). His contract has been unanimously extended through the 2018-2019 season. Since 2001, Mr. Axelrod has conducted over 160 orchestras around the world, 35 operas and 60 world premieres. Some of his long term relationships with European orchestras include Berlin’s RSB, NDR Symphony Hamburg, hr-Sinfonieorchester Frankfurt, Hamburger Symphoniker, Orchestra Sinfonica della RAI Torino, Teatro La Fenice Orchestra in Venice, Teatro San Carlo Orchestra in Naples, Opera di Firenze and the Orchestra del Maggio Musicale Fiorentina, OSI in Lugano, Camerata Salzburg, Mariinsky Orchestra, Sinfonia Varsovia, Radio Symphony Orchestra Vienna, and the Grazer Philharmoniker among many others. In Japan, Mr. Axelrod regularly conducts the Kyoto and NHK Symphony Orchestra. In the USA, Mr. Axelrod has performed often with the Chicago Symphony, Los Angeles Philharmonic, The Philadelphia Orchestra and the National Symphony among others. Besides his diverse programs of core and contemporary repertoire with the ROSS in Sevilla and La Verdi in Milano, these upcoming seasons Mr. Axelrod debuts with the Filarmonica della Scala, the Seoul Philharmonic, and returns with the RAI Symphony Orchestra of Turin, the WDR Funkhausorchester in Koeln, the OSI in Lugano, the Orchestra del Maggio Musicale Fiorentino, among many others. John Axelrod’s opera activity includes Bernstein’s Candide at Théâtre du Châtelet, Teatro alla Scala and Maggio Musicale Fiorentino, Dove’s Flight for Leipzig Oper, Tristan and Isolde for Angers/Nantes Opera, Eugene Onegin at Teatro San Carlo in Naples, Erwartung, La Dame de Monte Carlo and La Mort de Cléopâtre all for the Spoleto Festival, Kurt Weill’s Aufstieg und Fall der Stadt Mahagonny at the Rome Opera, Fabio Vacchi’s Lo Specchio Magico at the Maggio Musicale Fiorentino and Martinu’s Mirandolina at Teatro la Fenice in Venice. For the Lucerne Festival from 2004-2009, he has conducted: Rigoletto, The Rake’s Progress, Don Giovanni, the Three Penny Opera, Falstaffand Idomeneo. Upcoming opera engagements include Korngold Violanta at the Opera di Firenze. Mr. Axelrod is actively committed to working with young professional musicians, being engaged as the Principal Conductor of the Pacific Music Festival in Sapporo and having toured with the Santander Orchestra in Poland, the Schleswig-Holstein Festival Orchestra to the Salzburg Festival, the Orchestra Giovanile Italiana in Italy, the Accademia della Scala to Muscat, the NordDeutsche Junge Philharmonie in Germany, and the Vienna Jeunesse Orchester in Austria. Mr. Axelrod has recorded core and contemporary repertoire for Sony Classical, Warner Classics, Ondine, Universal, Naïve and Nimbus. Mr. Axelrod’s most recent release is a cycle of Brahms Symphonies combined with Clara Schumann lieder entitled Brahms Beloved on Telarc, with Orchestra Sinfonica di Milano Giuseppe Verdi and accompanying Dame Felicity Lott, Wolfgang Holzmair, Indra Thomas and Nicole Cabell. 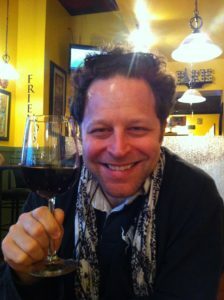 Mr. Axelrod is also a published author and blogger about wine and food. He is also the founder and president of CultureALL Association, based in Switzerland.